As you can see in the video below, yesterday was the House Transportation Finance committee hearing on the DANGEROUS ID act. If enacted into law, it’ll give any future Secretary of the Department of Homeland Security the singular, arbitrary ability to change the terms on when and where a DANGEROUS (REAL) ID card is required — with NO Congressional oversight! Down the road it could mean chipped identification being mandatory for firearms and ammo purchases as well as for healthcare and virtually anything the DHS Secretary chooses. More than that, over time it would create a centralized, national database of every law-abiding American gun owner. It’s a Pandora’s Box of backdoor gun control — obliterating the Tenth Amendment and leaving our Second Amendment flank wide open for future attacks! After hundreds and hundreds of you poured phone calls and emails into their legislative offices over the last few days – which the committee openly admitted to – they IGNORED the will of law-abiding gun owners and passed DANGEROUS ID. As we saw yesterday, House leadership is on a RAMPAGE to pass DANGEROUS ID – whether you like it or not! One of the most appalling attacks on your gun rights came from committee member Jason Rarick. 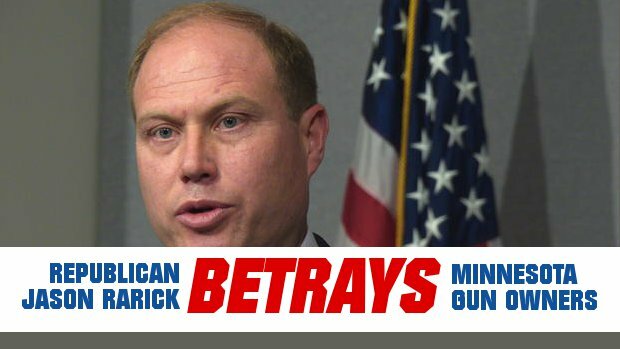 After filling out his candidate survey 100% in support of the Second Amendment during the 2014 elections, gun owners STORMED the polls and booted out his anti-gun predecessor, sending Rarick to St Paul to be a leader for gun rights freedoms. How did he repay gun owners? Only hours into his first term he shattered his campaign promises to sponsor Constitutional Carry, digging in his heels and outright refusing to advance the bill. And just yesterday, after hundreds of call and emails into legislative offices, he voted for DANGEROUS ID — a direct attack on the gun owners who sent him to St Paul in the first place! For a video recap of everything that took place yesterday, please click here. Now this bill moves on the Ways and Means Committee but the next major fight on this battle is going to be in the Senate. So please stay tuned and we’ll have more action items for you soon. Thank you for all you’ve done so far! P.S. For more details on how DANGEROUS ID is a direct attack on your gun rights, please read last Tuesday’s email below. Federal takeover of State Sovereignty. I don’t know about you, Site, but when I hear anti-gun legislators in St Paul talking about centralizing all of our personal information in a Federal Dangerous ID database scheme, I get greatly concerned. That’s what’s happening any moment now in St. Paul if you and I don’t act fast! House Speaker Kurt Daudt and his anti-gun-crony faction in the Minnesota House are about to take up HF3, the “REAL ID Act” better termed as DANGEROUS ID! Gun owners across the country have been fighting to oppose this dreadful legislation for years. Dangerous ID is a federal government power-grab designed to beat states into servitude and centralize citizen identification. It grants the Secretary of Homeland Security the EXCLUSIVE authority to decide where and when the new DANGEROUS ID will be required by law. If he or she decides you must have a new micro-chipped “for federal purposes” license to buy a firearm, there’s nothing the state of Minnesota can do to stop them. Heck, there’s nothing CONGRESS can do to stop them. No DANGEROUS ID card? You lose your Second Amendment Rights. The Secretary of Homeland Security can arbitrarily decide to require DANGEROUS ID’s to buy alcohol, ammo or healthcare and even require it to ride public transportation. Big government will be watching every move you make. And to coerce Minnesota into submission, the federal government is threatening to ground flights in and out of Minnesota airports until Minnesota completely destroys the 10th Amendment and fully implements “DANGEROUS ID” into every facet of life. It’s a classic case of bully-on-the-playground. But instead of marching up to the bully and punching him right in the mouth (how bullies should be treated), Speaker Daudt is joining teams with the bully and trying to pass DANGEROUS ID. DANGEROUS ID opens Pandora’s box for attacks on gun owners. The centralized “DANGEROUS ID” hub in Virginia will immediately contain the name, addresses and soon the biometric information – like facial recognition, fingerprints and retinal scans – of every law-abiding Minnesotan. And national experts say it’s only a matter of time before the National Instant Criminal Background Check System (NICS) data and state carry permit data are thrown in as well. Most folks know what happens when gun owner data is centralized and cataloged. We’ve all seen the hacking scandals plastered all over the news. Minnesotans remember well when Target’s database was breached and over 40 million customers had their financial information compromised. Gun owners nationwide remember the massive Missouri scandal where the state patrol mistakenly sent a list of all 162,000 CCW holders to a lone investigator working for Obama’s Attorney General Eric Holder. Being sold by Speaker Daudt and anti-gunners across America as a “convenience” (chains always are, aren’t they? ), privacy and Second Amendment advocates alike agree health and firearms purchasing records will be centralized next. And that may explain why Speaker Daudt is going to such severe measures to sneak DANGEROUS ID through. 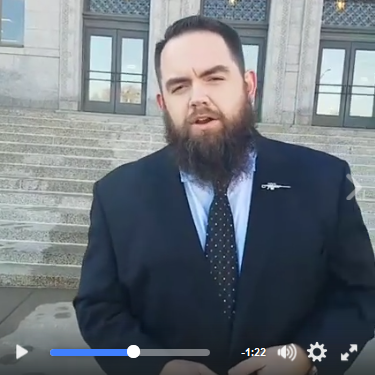 Insiders in St Paul report pro-gun and pro-civil liberty legislators at the capitol are being threatened and bullied by the Speaker’s office over their opposition to DANGEROUS ID. People close to the Speaker said he and his lieutenants threatened several members of the Civil Law and Data Practices Policy Committee, the committee tasked with passing the bill in preparation for a floor vote. Our sources went on to describe key legislators being commanded to “take a walk” during the committee vote or lose their seats on the committee! Alarmingly, Speaker Daudt has used threaten-tactics before. In early 2015, Daudt’s leadership team threatened pro-gun legislators who had agreed to sponsor Minnesota Gun Rights’ Constitutional Carry Bill! Commanding the legislator not to introduce the bill, Daudt’s team even went so far as to say any other legislation the pro-gun legislator had introduced for his district back home would be blocked! That’s why Daudt’s actions on DANGEROUS ID are so alarming. Daudt knows the ramifications DANGEROUS ID has on cracking down on your gun rights. And that’s exactly why he’s working overtime right now to cram this through before Minnesotans even catch on to what is happening. Thankfully, DOZENS of pro-gun legislators are trying to stand up against this gun-grabbing scheme and fight, but they need to know gun owners have their backs! This bill is slated to be heard by the House Transportation Finance Committee on Wednesday, January 18, at 1pm! That’s why we need your immediate action to help STOP this dangerous legislation! Please take a moment to call the members of the House Transportation Finance committee and tell them to vote NO on DANGEROUS ID! When you’re done, please forward this message on to your friends and family members! The House Transportation Finance Committee vote on this bill is going to happen Wednesday at 1pm. There is no time to spare – we need EVERY Minnesota gun owner to stand up in opposition to this bill. I don’t know about you, but I’m sick of this. Discipline begins at home, and gun owners didn’t go to all the hard work of booting anti-gun thugs out of office in November just to be browbeaten and betrayed by the likes of Daudt. We all stopped Universal Gun Registration last year. Please take IMMEDIATE action to help stop Dangerous ID too. P.S. Speaker Kurt Daudt and a select few of his anti-gun cronies at the Capitol are bullying pro-gun members of the legislature in order to sneak through the “DANGEROUS ID” act! DANGEROUS ID is, as Second Amendment and privacy experts across the country have said, a direct attack on the Second Amendment by destroying the Tenth Amendment. Over time, it would funnel federal and state databases of medical, biometric, carry permit and NICS records into a massive, centralized database connected to your driver’s license. Federal Government is trying to bully Minnesota into submissive compliance on DANGEROUS ID, and instead of punching back Speaker Daudt is RAMMING it through the Minnesota House! Please contact your legislator IMMEDIATELY and tell them to vote NO against the “DANGEROUS ID” bill. Then please take a moment to call the members of the House Transportation Finance committee and tell them to vote NO on DANGEROUS ID! When you’re done, please forward this message to all of your friends and ask them to do the same. Gun Control Bill Moving in Committee – Take Action!